A year ago Kennet BKA enjoyed an excellent talk on Bumblebees by Brigit Strawbridge so much so that she was welcomed back this time to talk about Solitary Bees. Brigit is a very knowledgeable, enthusiastic and entertaining speaker who supports her talks with some superb photos most of which she has taken. The UK there has one species of honey bee, 26 bumblebees and 270 solitary bees. Brigit took us through the various forms solitary bees can take, their size, colour and shape. They are important pollinators and have different apparatus for collecting pollen that is suited to their preferred forage. The most interesting aspect for me was the way they build their nests. The mining bees create elaborate nests underground, which few of us would notice. The cavity nesting bees are better known as it is they that inhabit the solitary bee houses that adorn our gardens. All in all a most enjoyable evening. Dan is currently the bee inspector for Mid-Wales but some years ago was living in America where Small Hive Beetle is in most colonies and were certainly in his, so Dan was speaking with personal experience. Small Hive Beetle started off in Africa where the native bees have developed ways of keeping it under control. It has since found its way to America, Canada and Australia almost certainly imported on goods from an infected area. It arrived in Italy a few years ago and the Italian authorities are working hard to eradicate the outbreak. Sadly there is every chance that it will eventually arrive in the UK. It is the beetles larvae that do the damage in the hive. Each beetle lays thousands of eggs in cracks in the hive which the bees cannot reach. 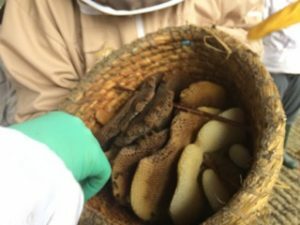 When these eggs hatch after 4-5 days they will eat everything in the hive, honey, nectar, wax, eggs and larvae with the result that a weak colony can turn to mush. However a strong colony will attack and eat the larvae as soon as they emerge on the comb. There are also other control measures whereby the beekeeper can help his bees fight the infestation. After 10-16 days in the hive the larvae drop onto the soil to pupate before emerging 4-6 weeks later as adults. The authorities in Italy are actively seeking to destroy the pupae at this stage by drenching the ground and killing the pupae: the pupae are also vulnerable to nematodes at this stage. Dan’s conclusion was that the beetle would not be the end of British Beekeeping but sincerely hoped that it did not reach our shores. Kevin Pope is a very experienced beekeeper with a significant number of hives primarily geared to maximising honey production. He has also recently been appointed our Regional Bee Inspector. In order to maintain his colonies in the best possible condition Kevin needs a steady stream of high quality queens that develop colonies that meet his requirements. Each year he imports a couple of queens from Ireland from which he breeds his queens using the techniques developed by Mike Brown at the National Bee Unit for Queen Rearing in a Queen Right Colony. This system requires colonies to be on double brood boxes and bursting with bees. He then grafts very young larvae into cups on grafting frames, which could produce up to 20 queen cells at a time. Kevin is surrounded by commercial beekeepers who rear hundreds of queens each season so by their standards this is ‘small scale’ queen rearing. 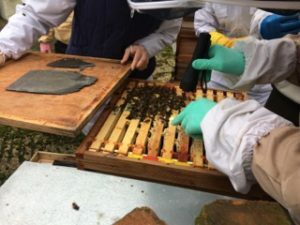 However queen rearing in this way is probably more demanding of time and equipment and potentially produces far more queens than can be justified by the hobbyist beekeeper who just needs to re-queen one or two colonies each season. But for those interested in queen rearing and grafting, see the link to Mike Brown’s article explaining the technique. 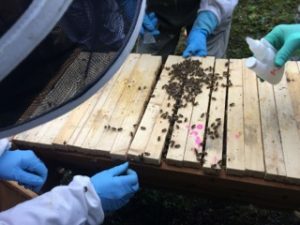 Drones – getting queens mated seems to have been more difficult in recent years and Kevin suggested that one reason for this was a shortage of drones as beekeepers cull them as part of their varroa management. We need all the drones we can get, the more the merrier, so do not cull drones. A full house of Kennet BKA members turned up to listen to Chris Parks talk. His passion for history, myths, legends and of course mead certainly gave the audience an intoxicating historical journey of the ‘Honey Isles’ or British Isles. We listened intently about how mead / honey based alcoholic drinks and honey have featured in literature, myths and legends throughout history and even archaeological digs have found pottery vases with evidence of Meddyglyn (Metheglin) or ‘healing liquor’ within. After the talk there were few members who passed over the chance to taste some complete hive mead from a horn cup. It would have been rude not to! Members of Kennet BKA turned out in force to listen to a talk on Bumblebees by Brigit Strawbridge. Brigit is very knowledgeable and passionate about the need to help our bumblebee and solitary bee populations. She spoke with humour and boundless enthusiasm. Further the photographs she used to illustrate her talk, many of which she had taken, were superb. All of us left the hall with a better understanding of the life cycle of the bumblebee population and how we can help them with nesting sites and bee friendly planting. For those who wish to learn more about the 20 species of bumblebee and 240 species of solitary bees that inhabit the British Isles Brigit recommended The Field Guide to the Bees of Great Britain and Northern Ireland by Steven Falk. Brigit also has a very informative blogspot, www.beestrawbridge.blogspot.co.uk, which is well worth a visit not least to see more of Brigit’s amazing photos. There was a strong turnout for the first monthly meeting of the year. 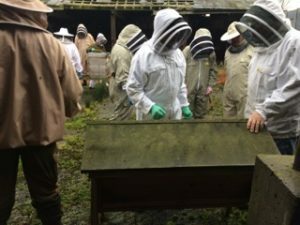 A panel, chaired by branch chairman Robert Carpenter-Turner and assisted by Alan Stonell and Richard Oliver, answered questions and offered advice on varroa control, feeding colonies between now and April, looking out for Asian hornets in the Spring, action needed in the event of a fellow beekeeper suffering anaphylactic shock after being stung and several other related topics. The club held a meeting at the branch apiary to treat the colonies with oxalic acid and also to enjoy a mince pie and a glass of mulled wine! David Brown, the apiary manager, demonstrated how to treat bee colonies with oxalic acid using the 5ml dispensers. Using a dispenser helps to ensure the right amount of oxalic is distributed along each seam. John Hooper then put this technique into practice on a national hive and then on the top bar hive. The top bar hive proved to be somewhat feisty so their treatment was undertaken rather quickly!